Toccata prima in D oder "Erstes musicalisches Blumen-Feld"
Toccata quinta oder "Funffes musicalisches Blumen Feld"
Toccata quarta in E minor oder "Viertes musicalisches Blumen-Field"
Chorale Prelude "Nun komm der Heiden Heiland"
Chorale Prelude "Komm, Gott Schopfer Heiliger Geist"
Chorale with eight Partitas "Alle Menschen müssen sterben"
Chorale Prelude "Ein feste Burg ist unser Gott"
Vincenzo Pellegrini: Canzona per organo "La Serpentina"
Michael Praetorius: Hymn to the Holy Trinity, "O Lux beata Trinitas"
This monumental survey by the great Austrian organist Herbert Tachezi is testament to the rich heritage of Austrian organs particularly those from the Upper Austria region. The varied list of composers shows the versatility of the instruments ranging from the organ in the Hofkirche, Innsbruck to the lovely sounds of the Great Organ in the Stilfbasilika, Klosterneuburg. 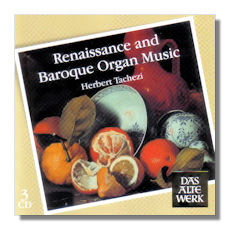 Tachezi plays with a particular love for the great German composers of the early baroque period lending particular dignity and sober intensity to the works of Pachelbel, Froberger, Kerll and Speth in particular. However he is no less inventive and virtuosic in music from other countries such as the Italian connection which forms most of the first disc including some stunning renditions of music by Gabrieli, Frescobaldi and Rossi. Teldec's recordings are spacious and astonishingly clear with the range of each organ receiving particular attention all around. Yet again Tachezi proves to be a versatile and highly talented virtuoso and the extensive notes provided for the set are also essential reading. Lovers of great organ music should obviously do their utmost to snap up this fine collection.